Theunissen is a small town that has the only wine estate, the Theunissen Wine Farm, in the Free State province of South Africa. It was founded by Boer War Commandant Helgaardt Theunissen. Theunissen has a small community (mostly farmers and miners) which supports the local businesses. the last section from Kroonstad to the Vaal River on 7 May 1892. The line reached the Witwatersrand during the same year. Smaldeel station was erected directly to the west of Winburg. 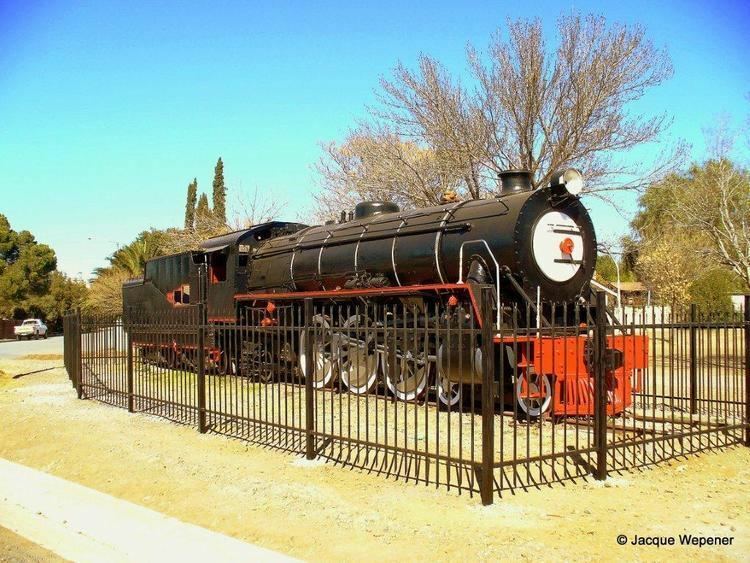 Because Winburg, the oldest town in the Free State, was not connected with the main railway line, the residents insisted that the OFS Government had to build a railway line from Winburg to Smaldeel. After careful consideration, the Government decided that a railway line will be built through Winburg to Clocolan. The line from Smaldeel to Winburg was opened on 1 November 1898. The building of the line to Clocolan was in an advanced stage when the Second Anglo-Boer War broke out. The line, to date, has not been completed. The request from the residents of Winburg, with 67 signatures, opposing this. 1. That Smaldeel is an important Railway Junction with refreshment room employing a full staff. 2.That there are 7 General Stores, 1 butchery, 2 bakeries, 2 boarding houses, a large Government School with 1 principal and 2 assistant teachers and an attendance of 100 children daily, a Dutch reformed church, a Court House with a Special Justice-of-the-Peace. 3. That Smaldeel has a population of some 400 souls of which 200 plus minus are coloured and it already presents the appearance of a town. 4. That having such a considerable population it is desirable and very necessary that the place should be under proper Municipal supervision for reasons of sanitation, the bad state of the Roads and Streets, the want of proper rules as to native location and the proper control of natives and wandering stock, etc. 5. The funds have been nearly fully subscribed to erect a D.R. Church to seat 600 people, the present church building to be converted into a parsonage. 6. That is very necessary for the whole of the very large and extended Ward Vet River to have a proclaimed Township at Smaldeel, it being as near as possible central for the ward, and almost equidistant from Winburg, Brandfort, Bultfontein, Odendaalsrus and Ventersburg, as the outlying farms of the Ward Vet River are from 35-42 miles distant from their political centre, Winburg, and it is next to impossible for the inhabitants living so far away to get there whenever it may be necessary. B. That the farms of which the proposed township will consist are Albany, 1912 morgen (widow Rasmussen), Smaldeel 891 morgen (S.J. Nieman), Statie 61.5 morgen (W. Mucke), Winburg Road North (W. Isaacman), Railway Curves 106.5 morgen, in all plus minus 3000 morgen. C. That a resolution was passed at a public meeting of Householders held in the Court House on the 30th day of April 1906 that the municipality of the proposed Township shall consist of 7 members. When a request was submitted that a Township be established at Welgelegen instead, a petition was signed by 232 farmers and residents of Smaldeel. This was not the only requisition that was submitted opposing the proclamation of a town. On 20 July 1906 and 6 February 1907, opposing requisition was received from Winburg and Kroonstad respectively. It was impossible for the Legislative Council to make up its mind right away. A few months later the petitioners from Smaldeel received a letter from the Secretary of Legislative Council dated 18 September 1906, stating that the case of proclaiming a town will be investigated by a commission of enquiry consisting of Surveyor General, Mr. J.W.H. Steyn and Mr. W.J.C. Brebner. They were also informed that certain improvements needed to be made to their letter of request. “I have the honour to inform you that the Legislative Council has sanctioned the formation of a township at Smaldeel on conditions of which I enclose a copy"
iv) That land is set aside for the building of a church, school, magistrate buildings, post office, jail, town hall, etc. v) That at least 2 town squares be lain out. vi) That the streets may not be less than 70 feet wide. A township has been formed at Theunissen formerly known as Smaldeel in the district of Winburg in terms of the resolution of the Legislative Council dated 1st March 1907, consisting of the following farms viz. Statie No. 667 registered in the name of A.N. Mucke, Smaldeel No. 262 registered in the name of S.J. Nieman and that part of the farm Poortjie No. 259 registered in the names of J.W.A. du Plessis and J.A. du Plessis and situated between the North East Boundary of the farm Smaldeel and the main railway line, all in the said district of Winburg. Given under my hand and the public seal of the Orange River Colony at Bloemfontein, this 13th day of September 1907. South African Formula One driver Neville Lederle was born in Theunissen in 1938. Springbok rugby legend, Os du Randt had a farm called Tama just outside the town. The pilot of the first solo flight between London, UK and Cape Town via Cairo in 1920, Sir Pierre van Reyneveld, owned a house near the current Senwes grain-silos and train station. It is currently a bar/restaurant.